I am very pround to report that Carter has been doing some “pretend” play lately and he’s been using his toys the way they are meant to be used. This may not seem like a big deal for most parents, but for us, it’s a very big deal. Children with autism, like Carter, don’t play the same way other children do. Carter is more of a solo act. He doesn’t play with other kids, he can examine a DVD case forever, you’ll see him “read” and “reread” a book and sometimes he just zones out. 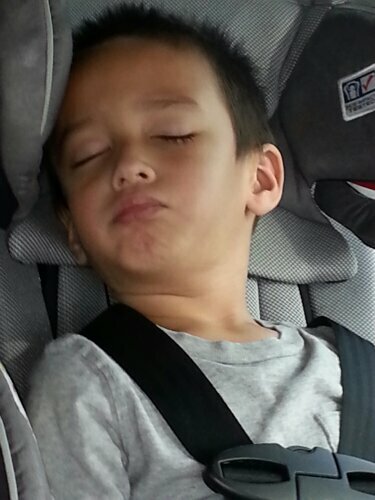 Carter won’t pretend that he’s driving a police car and make cop car sounds. He won’t pretend that he’s Buzz Lightyear and that he’s here to save the day. He won’t pretend that he’s “talking” on the telephone and when he play with a toy truck or car, all he does is spin the wheels. 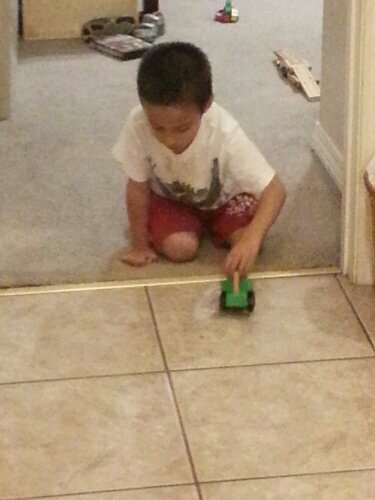 He’s been rolling the cars around instead of just spinning the wheels. It’s really great to see all these improvements and changes that Carter is making. Now if we could just work on that behavior! Love that kid either way.